Roll Out REDUX February 22nd! In exactly two weeks from tonight, ROLL OUT returns to South Florida! DJ Hottpants and I threw Roll Out every Tuesday night at Gold Coast Roller Rink for about a year and a half in 2006/2007 and it was FUN TIMES. The rink is basically trapped in time from the ’80s with neon decor, carnival lights, a snack bar – the whole shebang. We spun the guiltiest of guilty pleasures, everything from classic skating “shuffle” tracks like Clear by Cybotron to pure cheese like Debbie Gibson, along with freestyle, electro, indie, hip hop, R&B and beyond. The rink also has a full bar with cheap drinks, which means you can grab a beer or spike your slushie. We’re doing it all again Tuesday, February 22nd at 8pm. 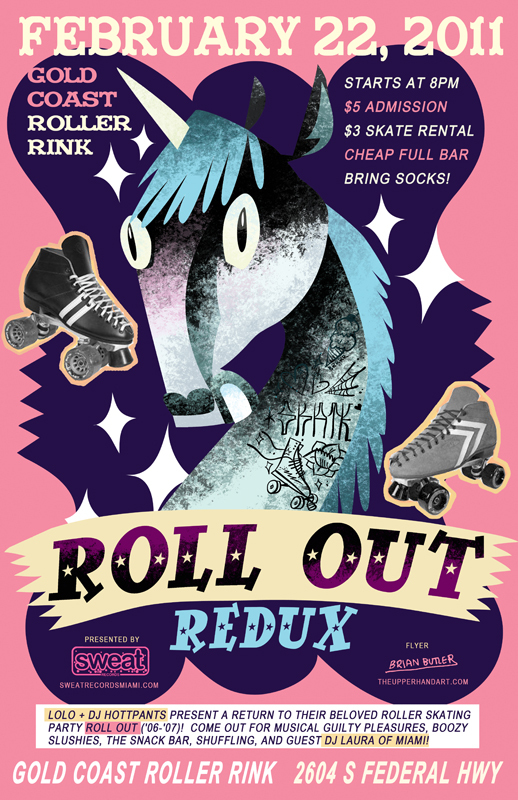 Grab your skates (or rent some there) and roll out!